For some people, being green means changing their light bulbs. For the Exploratorium, a San Francisco landmark and science center, the board of directors decided to implement a state-of-the-art science and technology institution from the ground up in hopes of becoming the world’s largest net-zero energy museum. After it moves to San Francisco’s Embarcadero, technology developed to take advantage of its new location on the bay will generate enough energy to sustain itself its operations and potentially create a surplus of power. The process took almost a decade of planning, renovating and building. When the museum reopens April 17, visitors will notice that the new green technologies will be highlighted as exhibits on display. With its heavy investments in sustainability—including high-efficiency solar panels and an HVAC system that uses water from the San Francisco Bay to heat and cool the museum—the Exploratorium's hoping to lead by example, both for companies and everyday consumers. "We want to be on the edge of innovation," Exploratorium director Dennis Bartels said. “There’s still a lot of debugging yet to be done. In the process, we all learn together so the technology keeps getting better and so the regular consumer doesn't have to take a big financial risk." To be sure, the Exploratorium only has projections so far, but they are promising a solar roof that could power 300,000 square feet year-round, 1 million gallons of water saved annually and near-autonomous systems that require minimal maintenance. Realizing the 100,000 square feet at the Palace of Fine Arts couldn't support the Exploratorium's visions, a search committee began scouting for a new location. By 2004, the San Francisco-based architectural firm EHDD began working with the museum on a design along the shoreline. Relocating to Pier 15 would triple the museum's available space, and Pier 17 would provide 2.5 acres for future expansion. The proximity to downtown would increase foot traffic, especially with bike paths and multiple public transportation hubs nearby. Moving to Piers 15 and 17, which were built in 1915 and 1912, required repairing the dilapidated structures and supports. Still, despite this preservation challenge, Kristina Woolsey, who spearheaded construction as the project director, saw potential for record-setting sustainability. Take, for example, the two large cisterns that sit below the beams connecting to the southeast pilings. Together, they can capture and store about 338,000 gallons of rain and fog runoff to use as gray water, with the rest returning to the bay after being filtered. Furthermore, dual-flush toilets and waterless urinals are expected to save 1 million gallons of water each year. More impressive is the heating and cooling system. Instead of boilers or cooling towers, the museum leverages this body of water as a heat source and sink. "Temperature-controlled seawater," Building Operations Manager Chuck Mignacco said jokingly. The bay's moderate temperature fluctuates 55 to 65 degrees seasonally. The Bay Water Heating and Cooling System—a massive collaborative effort between the museum, engineering firm Integral Group, EHDD architects and marine contractors from Power Engineering Construction Company and Nibbi Brothers General Contractor—will circulate about 73,800 gallons of water every hour through the floors, keeping the Exploratorium at a comfortable 71 degrees. Water is filtered in three stages to remove sea life and bacteria. The first set of filters features 1/16-inch holes; the openings on the second set measure 30 microns, about half the diameter of a strand of human hair. 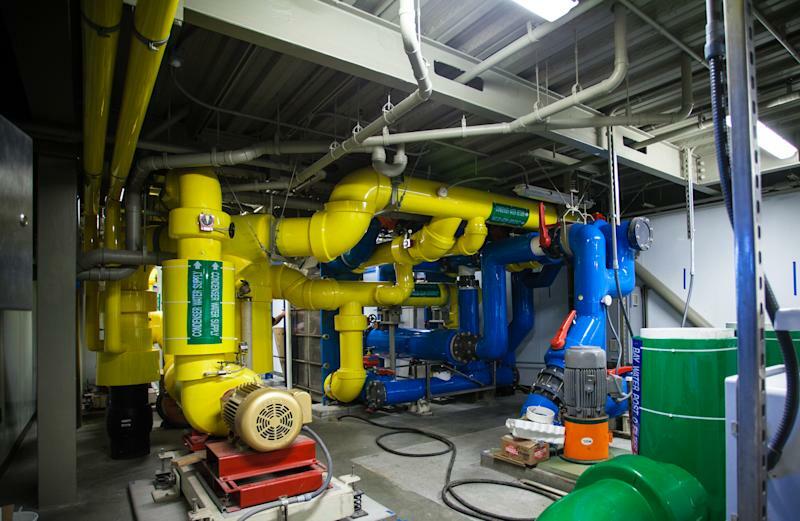 UV rays kill the remaining bacteria, and the water is pumped through a pair of titanium heat exchangers into 25 miles of tubing that runs eight inches under the concrete floor. The system runs on full auto, alerting the operations manager if there’s a malfunction. Though a window lets onlookers peer behind the scenes, this technology is mostly invisible beneath visitors’ feet. Two stories above their heads, technology is humming as well on the carbon-neutral roof. The Exploratorium is home to the second-largest solar roof in the city, first among those that generate power for local use. (The titleholder is the San Francisco Public Utilities Commission, which sells the energy it produces.) All in all, the panels make up 78,712 square feet of the roof, roughly the size of a FIFA-sanctioned soccer field for international matches. With the aid of state and federal grants, the solar panels will cost about $1 million and is expected to pay for themselves within 10 years, maybe sooner. The rooftop is adorned with 5,874 SunPower solar panels, which are 50 percent more efficient than traditional panels and can also be found throughout residences in California. With 10 roof zones, each with its own inverter and power infrastructure, the panels are placed in various angles to minimize reflection and maximize light absorption. That’s an output of 1.3 megawatts, enough to power 1,000 average American homes each year. Over the 30-year life of the system, that's about 33,150 fewer tons of carbon dioxide emissions, or about 6,000 cars off the road. How much power the roof generates will fluctuate throughout the year. The Exploratorium will likely draw from the power grid during the evenings and winter months. But warmer days, especially in the summer and fall, will produce more energy than the Exploratorium needs, with the excess returning to the city's grid for public and private use. Overall, that balances out to net-zero energy, which Woolsey defines as generating as much power as the museum uses. While visitors can't access the roof per se, the bulkhead lobby will show real-time performance with updates every 15 minutes. Like the HVAC system, there's little maintenance, thanks to seasonal rains. "The rain is a miracle worker," Mignacco, the operations manager, said as he climbed a ladder to look over the pristine panels. "The roof looked like a Jackson Pollock yesterday." The Exploratorium is the brainchild of Frank Oppenheimer a physicist whose varied career included working on the Manhattan Project—his brother J. Robert Oppenheimer directed the program and is referred to as the father of the atomic bomb—and a stint as a cattle rancher after being blacklisted by the House Un-American Committee in 1949. Passing on an offer to design a new branch for the Smithsonian, Frank Oppenheimer chose to work on his own "San Francisco project," and the Exploratorium opened in 1969. He filled the vacant space with exhibits built using donated post-World War II machinery, which can still be found in the museum's workshop today. He served as the Exploratorium's first director until his death in 1985. The museum’s old location at the Palace of Fine Arts in the city's Marina district was serene, with gorgeous lagoon-front views as well as Roman- and Greek-inspired architecture leftover from the 1915 world expo. But it was growing cramped for its 475 exhibits, 570,000 annual visitors and many more projects underway. When current director Dennis Bartels stepped into his role in 2006, he was charged with leading a $300 million capital campaign project. Those dollars would cover pier renovations like repairing 4,000 underwater pilings, 66 years worth of rent to the Port of San Francisco and solar panels that will pay for themselves in a decade. Some experts estimate going green will cost the Exploratorium a 5 percent premium in renovation expenses, but Woolsey notes the capital campaign is an investment to reduce costs down the road. "$300 million represents rent for 66 years and power," she says. "If power costs go up, and we think it will, we'll save even more money." "Green is not a gimmick," Woolsey asserts. "You can see it throughout everything." The devil is in the details. Eco-friendly vendors chose furniture made with certified wood, and the food served at the restaurant is sourced sustainably. Windows and skylights take advantage of natural light, supplemented by fixtures programmed to adjust to changing lighting conditions throughout the day and hundreds of sensors. The exhibits themselves are also thinking green moving forward. The 10 most power-hungry displays consume 30 percent of energy used by all exhibits, so designers are tasked with decreasing average power consumption. When the Exploratorium reopens, a quarter of its 600 exhibits will be new, built with eco-friendly principles in mind. The workshop that creates them will see changes as well. Equipment purchases will be carefully vetted, especially since much of what exists—the vintage machines Oppenheimer collected throughout his tenure—have proven highly inefficient. However, instead of scrapping them, the museum will hold on to the infrequently used equipment, turning them off when inactive. Despite the emphasis on sustainability, LEED, a voluntary verification from the U.S. Green Building Council, isn't the goal. “LEED's a very expensive process—a lot of documentation and extra bureaucracy to get it done," Bartels says. Still, the museum has filed the necessary paperwork, awaiting its certification as of February. "We think we're Platinum," he adds, referring to LEED's highest rating. Two months before show time, the construction zone is starting to take shape. "Some of us like it more under construction," Woolsey quips. But she's ready for April. "I've been on-site for two years, and I love looking at the possibilities. The fact that it's inhabited by people and soon visitors is exciting."